Although nobody can know what the future holds, many institutions try to appraise the possible trends of the different fuels in the next decades. The main reason is that energy is at the heart of the world economy and even if forecasts won’t match reality, they are an essential tool to activate today’s key policy changes. Looking into the future, or at least trying to do so, is obviously an intellectual work, hence outcomes below must be taken with prudence. Comparing different data sets from different sources is a difficult exercise. Each institution has its own definition, methodology, geographic coverage and often report data in different units. We harmonized all the data series to the largest extent possible. Although differences remained, they were not seen too big to result in dramatically different analysis/conclusions. All institutions/companies listed above agree that global energy use will maintain a solid upward trajectory in the next 25 years with fossil fuels remaining dominant in the overall energy mix. Despite a spectacular increase of non-fossil fuels use (nuclear and renewables energy), the share of fossil fuels will only slightly decrease to at least three quarters of the global primary energy demand by 2040. It had remained broadly constant above 80% over the last 25 years. They all agree that oil will remain the single largest fuel in the energy mix throughout the projection period. Although oil demand will continue rising, its share in total energy demand will decrease to about 30% in most scenarios. Demand for natural gas will grow faster than that of any other fossil fuels. Share of gas in total energy demand is expected to slightly increase to about 25% by 2040. * to 2035 for BP. Source: OME based on IEA, EIA, BP, ExxonMobil, and Statoil. 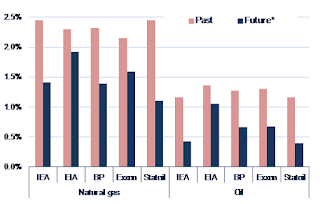 However, there are some divergences between the outlooks with regards to the scale of the future oil demand growth. With an average rate of only 0.4% per year, the IEA and Statoil envisage a sharp slowdown in oil demand growth in the next 25 years, while BP and ExxonMobil foresee an average annual growth of around 0.7% per year. In contrast, the US EIA, forecasts an oil demand growth above 1% per year on average. Source: OME based on IEA, EIA, BP, Statoil and ExxonMobil. * to 2035 for BP. The EIA is the most enthusiast for natural gas demand growth as well. It projects a maintained solid pace in gas demand growth in the future compared to the recent past. According to the US administration, the share of gas in total electricity generation could further increase to 28% (from around 22% today). Conversely, the other institutions expect a strong deceleration of the natural gas demand growth around 1.5% per year on average. The IEA is the only one anticipating that consumption of natural gas will not surpass the level of coal within the projection period, in energy-equivalent terms. In addition, according to the IEA, the share of gas in total electricity generation will merely gain one percentage point compared to today’s level. Statoil scenarios, however, differ from the others. Its Reform and Rivalry scenarios see continued growth in demand (1.1% per year) whereas the third scenario, Renewal, is characterized by stagnant demand or zero growth. When looking at oil and gas forecasts of the different scenarios by region, we see a clear shift of the centre of gravity of oil and gas markets from the OECD to the non-OECD. If OECD used to represent main oil and gas consumers in the world, this is no longer the case. Demand for oil and gas in non-OECD countries today is already higher. Non-OECD countries are taking over and leaving behind OECD countries as the main oil and gas consumers in the world. Population and GDP growths remain clear markers of the future trends of global oil and gas demand. Europe, in contrast, is an isolated island in this oil and gas world. In the future almost all the growth in gas demand, all in oil demand is expected to come from non-OECD countries. With much faster rates of economic and population growth than OECD countries, non-OECD countries are expected to use all possible means, including fossil fuels, to satisfy their strong demand growth in energy while OECD countries will increasingly replace fossil fuels with low-carbon fuels in their energy mix. Source: OME based on IEA, EIA, BP and ExxonMobil. Share of non-OECD countries in global oil and gas demand is projected to reach about 65% and above 60% by 2040 (by 2035 for BP) respectively. IEA, EIA, BP and ExxonMobil all agree that oil needs in non-OECD countries will increase significantly in the future; by as much as 50% for the IEA, BP and ExxonMobil, and by almost 70% for the US EIA. Consensus is less obvious with regards to future oil demand in OECD countries. While the EIA expects consumption of oil to remain stable in the next 25 years (only -0.2% from today to 2040), the IEA forecasts a drop of about 30%. 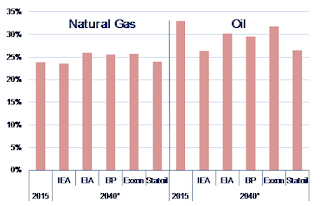 In the case of future natural gas demand, the EIA again is more optimistic. 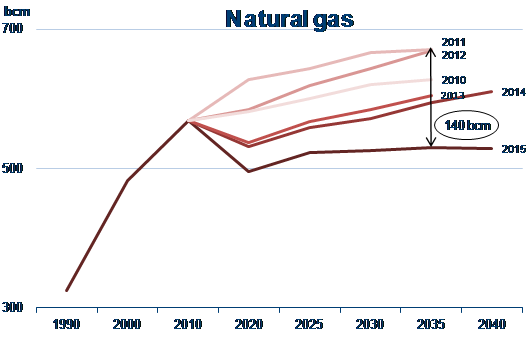 The EIA projects the gas needs in non-OECD countries to double and increase by one-third in OECD countries by 2040. Others are somewhat more “moderate” and expect non-OECD gas demand to increase by about 70%. For OECD, the growth rates in gas demand are different and range between 13% (IEA) and 27% (ExxonMobil). Every institution makes revisions to forecast due to several reasons, such as better knowledge of market trends, better available data, changing policies and priorities. This is why it is also instructive looking at future oil and gas demand forecasts through another angle: release date. In order to show an example, we looked at the evolution throughout the years of the different World Energy Outlook (WEO) New Policies scenarios of the International Energy Agency for oil and gas. We narrowed our analysis to OECD Europe only to check if some comparisons can be drawn with the revisions of OME for the Mediterranean region. The IEA does not propose an aggregate with Mediterranean countries but parallels exist between this aggregate and OME sub-region, North Mediterranean. Since at least 2011, the IEA has revised its future OECD Europe oil demand mostly downward. 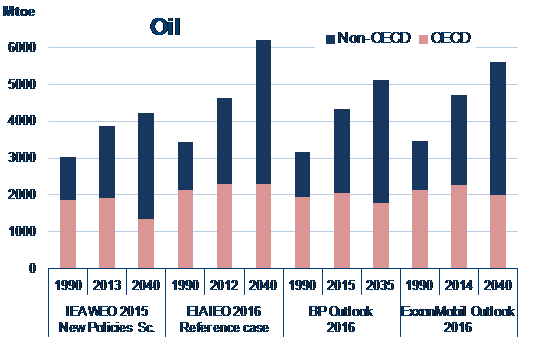 It is worth noting that between World Energy Outlook (WEO) 2010 and 2015 releases, the IEA revised oil needs in OECD Europe for 2035 downward by 20%. In volume, the magnitude of the revision was 2.2 million barrels per day. Just between the last two editions, OECD Europe oil demand by 2040 was reduced by a stunning -10% or 800 thousand barrels per day. Source: OME based on IEA (WEO 2010 to 2015, New Policies Scenario). Revisions in WEO editions are even larger in the case of future OECD Europe natural gas demand. While consumption of gas in Europe keeps declining since the late 2000s, naturally, gas demand forecasts were revised accordingly. In its last edition (WEO 2015, released in November 2015), the IEA anticipated OECD Europe gas demand at about 530 billion cubic metres (bcm) by 2035. This is 100 bcm less than the demand forecast in the 2010 edition, and about 140 bcm less than those in the 2011 edition when the question of a world entering a golden age of gas was first asked. In only five years, between WEO-2010 and WEO-2015 editions, gas demand for OECD Europe for 2020, the closest term in the projection period, has been revised downward by almost 90 bcm; and by about 130 bcm when we compare 2011 and 2015 editions. 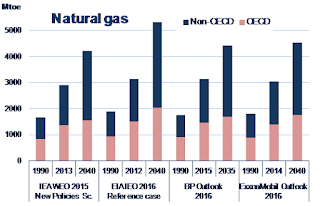 The gap for the year 2040 between OECD Europe gas demands in the last two WEO releases is more than 80 bcm. IEA analysis reflects the fast-increasing uncertainty that is observed by all analysts about future European fossil fuels needs, in particular for natural gas. Now, there is a strong belief that gas use in the region already peaked and will stagnate in the next decades. While the future for natural gas looks still bright in the rest of the world with a sound increase of demand repeated from one update to the other, the future of gas in Europe is to some extent questioned. The strong post-crisis recovery of the gas demand in Europe in the beginning of the 2010s was short-lived. Among others, main culprits were a disappointing growth path and sluggish electricity demand, a certain degree of vagueness with regards to the EU energy strategy and the place of natural gas in future energy mix. Modest and delayed economic recovery in several European countries as well as the policy push for more green energy future makes the place of natural gas in the long term energy mix rather fuzzy. This would surely make the long term forecasts very uncertain. In contrast, long term gas production forecasts are usually expected to be less uncertain, at least in theory. 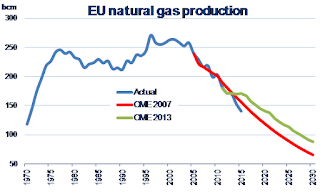 It is perhaps due to this reason that OME was criticized heavily for its gas production forecasts for the EU in 2007. OME forecasts at that time, and also in the following few years, were considered to be very pessimistic, especially compared to the forecasts from the EC and the IEA, as can be seen in the chart below. Almost 10 years later, we see that OME forecasts in 2007 are still remarkably close to reality. In 2013 there was a considerable hype about the shale gas production in the EU. This was reflected in the upward revisions by the EC and the IEA to the future EU gas production. 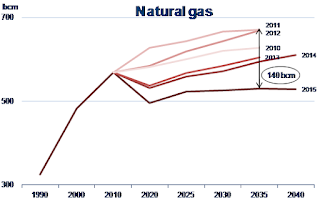 In 2013, OME also made a revision to its 2007 forecasts in order to incorporate the expectations concerning the shale gas developments in the EU. Source: OME based on IEA, Eurostat, BP data (past), OME (forecasts). Compared to the EC and the IEA, OME’s estimate for shale gas production at that time was rather pessimistic. Nevertheless, they naturally caused a shift in OME’s forecast to future EU gas production. Even then, OME’s forecasts for future EU gas production are still much lower than those of the EC and the IEA. Gas production is on a downward trend for almost a decade and still upstream development plans, whether conventional and/or unconventional, face strong public but also political rejection in many countries. The contribution of unconventional supply to the domestic European gas production is expected to remain modest within the next 15 years. 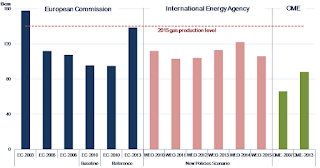 It is perhaps due to this expectation that in its WEO-2015 the IEA lowered, for the first time since 2011, its future EU gas production by 13% compared to the previous edition. 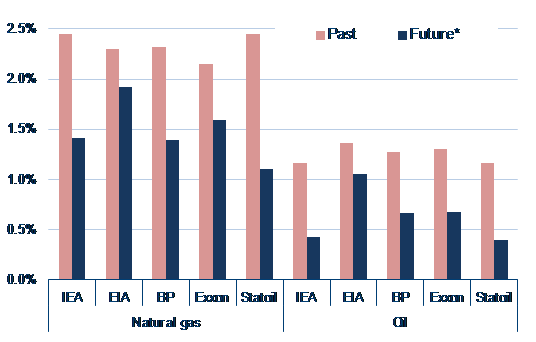 The review of the different scenarios of the IEA, US EIA, BP, ExxonMobil, Statoil and OME confirm that future energy mix will likely remain to be dominated by oil and gas. Who is right is not the point we want to raise here. Instead we would like to draw attention to the fact that the energy scene is moving permanently, sometimes with full of surprises. Who anticipated the shale boom in the US, its consequences (the US will become a net exporter of LNG in 2016! ), and the sudden drop in oil prices since 2014? Nobody knows what the next major changes in the energy world will be. We can only be sure that reality will be different from the ones forecasted. Place your bets! OME, Natural Gas Supply and Market Security Issues: Europe and Its Suppliers, June 2007. Born in 1965, I am an engineer and an economist by education (BSc, MSc, PhD, PostDoc), a number cruncher by experience, an energy analyst by profession, and a military energy analyst by passion. Currently I am working as director of hydrocarbons at an energy industry association in France. Before joining that association I was with the International Energy Agency in Paris. Previously, I worked as research associate and manager at several institutions in Austria, Turkey and Germany. I felt obliged to write this becuase many people ask my bakground. And no, I do not have any connection to the DOD.